Time off to provide care for the health and well-being of a family member or for a worker’s own illness or injury is a near-universal need of workers from all backgrounds. Paid family and medical leave offers protection against financial hardship for employees requiring such time away from work to provide or receive care. The United States is an extreme outlier in its lack of a national paid leave program. In the absence of a national program, several states have established paid leave programs for medical and family caregiving needs. States have taken different pathways to creating their paid leave programs and have pursued different design options in terms of structure, funding, and program administration. 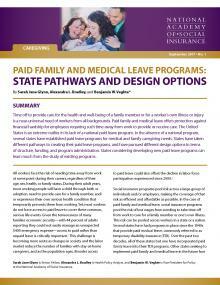 This brief discusses the current landscape of paid leave access, the history behind existing state-level programs, and policy considerations for states developing future paid family and medical leave programs. It begins with an overview of paid leave coverage in the United States, including a discussion of inequality in access to existing programs and benefits. This is followed by a discussion of the growing need for paid leave programs. The history of existing state-level policies is addressed through a description of the policy pathways and design choices that were made in the development and implementation of these programs. The brief then considers the benefits and challenges of various design options (i.e., program structure, funding, and administration) that states will weigh when designing new paid leave policy. Finally, the brief considers the current research on the economic and health impacts of paid leave programs, and discusses critical questions for future study. This brief was produced in conjunction with the Academy’s Leveraging Social Insurance to Combat Inequality project, funded by the Ford Foundation.